For the racecar driver with the same name, see M.C. Jones. Not to be confused with Milton Johns. Milton Hywel Jones (born 16 May 1964) is an English comedian. His style of humour is based on one-liners involving puns delivered in a deadpan and slightly neurotic style. Jones has had various shows on BBC Radio 4 and is a recurring guest panellist on Mock the Week. He won the Perrier comedy award for best newcomer in 1996. and in 2012, Another Case of Milton Jones was awarded silver in the 'Best Comedy' category at the 30th Sony Radio Academy awards. Jones tours the UK periodically and is a regular performer at The Comedy Store in London and Manchester. Jones wrote the surrealist, partially biographical novel Where Do Comedians Go When They Die? : Journeys of a Stand-Up (2009). Jones grew up in Kew, Surrey. His father is from South Wales. He attended Middlesex Polytechnic, gaining a diploma in dramatic art in 1985. He is married with three children and lives in the St Margarets suburb of Richmond upon Thames in London. He supports Arsenal FC. Jones is a Christian and often performs in churches and at Christian festivals. He is a patron of the charity Chance for Childhood. Thanks a Lot, Milton Jones! Where Do Comedians Go When They Die? Jones was also a writer for TV shows: he worked on The One Ronnie, Not Going Out and Laughing Cow. ^ "Radio 4 Programmes – Another Case of Milton Jones". BBC. 1 September 2011. Retrieved 23 October 2011. ^ "Radio 4 Extra Programmes – The Very World of Milton Jones". BBC. 4 August 2011. Retrieved 23 October 2011. ^ Millar, Paul (14 June 2010). "Jones: 'It's pressured on Mock The Week' – TV News". Digital Spy. Retrieved 23 October 2011. ^ "Gagging for it". The Sydney Morning Herald. 18 March 2005. Retrieved 15 August 2011. ^ "Sony Radio Academy awards winners: The full list of winners from the 30th Sony Radio Academy awards". The Guardian. Guardian Media Group. 15 May 2012. Retrieved 16 May 2018. ^ Bennett, Steve. "Where Do Comedians Go When They Die? : News 2009 : Chortle : The UK Comedy Guide". Chortle. Retrieved 23 October 2011. ^ Johns, Lawrence (10 February 2011). "There's more to Milton than just the 'surreal one-liners'". Herald & Post. Northampton: LSN Media Ltd. Retrieved 13 September 2011. ^ Moore, Cliff (3 October 2011). "Milton Jones, Bournemouth Pavilion". Bournemouth Daily Echo. Retrieved 30 October 2011. ^ Rowden, Nathan (3 March 2011). "King of the one-liners in town for Aberystwyth gig". County Times. Retrieved 11 September 2011. ^ Katbamna, Mira (17 August 2011). "My first year at university". The Guardian. Retrieved 30 October 2011. ^ "Milton Jones: I'm an Arsenal fan, but I loved Being Liverpool". Metro. 3 December 2012. Retrieved 11 May 2013. ^ "Milton Jones: Born again Christian & Frustration with Atheist Comedians", YouTube, 13 June 2014. Retrieved 6 December 2014. ^ McAlpine, Emma (3 November 2009). 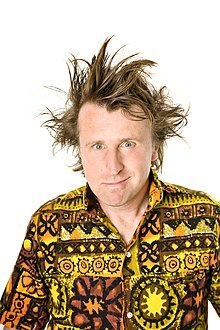 "Milton Jones: Interview". Spoonfed. Archived from the original on 9 November 2009. Retrieved 11 September 2011. ^ Evangelical Alliance (23 November 2010). "Culture Footprint:Milton Jones". Culture Footprint. Retrieved 4 October 2011. ^ "Chance for Childhood, Our patrons". Retrieved 6 August 2015. ^ "Milton Jones". noelgay.com. 2013. Retrieved 18 March 2013. Wikimedia Commons has media related to Milton Jones. This page was last edited on 4 April 2019, at 18:37 (UTC).